The A3 Sportback E-tron looks identical to its conventional A3 counterpart. VIENNA, Austria -- Audi plans to launch at least four plug-in hybrid cars as it bets on the technology to counter rival BMW's electric car offensive. Audi will roll out the A3 Sportback E-tron, its first plug-in hybrid, in Europe this month. U.S. sales of the compact hatchback are expected to begin in the second or third quarter of 2015, while China deliveries will start in the first or second quarter of next year. The plug-in hybrid will compete with cars such as the battery-powered BMW i3 in a bid to win customers looking for environmentally friendly vehicles. Audi CEO Rupert Stadler said today the A3 Sportback E-tron will be followed by other plug-in hybrids. "We strongly believe in plug-in hybrids and we will add a new model each year, beginning with the Q7 next year, followed by the A6 long-wheelbase sedan for China and the A8," Stadler said on the sidelines of the A3 Sportback E-tron's introduction here. Audi believes plug-in hybrids are the best solution for low-emission vehicles because they don't face the same range constraints as battery-powered vehicles. Plug-in hybrids use a conventional internal combustion engine but can also run on electric power with zero emissions. “Plug-in hybrids are electric vehicles for everyday driving, exactly what our customers are asking for,” Stadler said. The A3 Sportback E-tron can be driven under electric power for up to 50km (about 30 miles). Using the gasoline engine, it has a 600km range. BMW's i3 has a driving range of up to 160km, rising to 300km for the version with a range extender. Audi’s approach to clean-car technology diverges from the path taken by BMW, which created the “i” subbrand to showcase its environmental technology. The i3 city car and the plug-in hybrid i8 supercar have plastic exterior body panels and distinctive styling to make them stand out from other cars on the road. Stadler said he could not give a figure for how may plug-in hybrids Audi will sell. "Plug-in hybrids could account for 10 percent to 20 percent, even 40 percent of the 2 million units we plan to build annually by 2020. It will be our customers who decide, and we are ready to satisfy their demand,” he said. “Plug-in hybrids are fully integrated in our platforms and production process, so we are beginning with the A3 E-tron in Germany, but the same technology could be applied to the production lines we have in China and in Mexico,” Stadler added. Audi's approach may keep spending under control, but the question is whether customers will pay the extra cost for technology that’s not evident from the curbside. The A3 Sportback E-tron looks identical to its conventional A3 counterpart and starts at 37,900 euros ($51,700) in Germany. That’s 15,100 euros more than the base gasoline-powered version of the A3. Hiding its green technology under the hood could be a risk for Audi. Inroads by electric-car maker Tesla Motors into the luxury-car segment show that wealthy drivers are ready to buy upscale green cars, if they get noticed. That goes for the BMW i3 as well. Demand for the car prompted BMW to triple production of carbon fiber, which is used for the passenger compartment. Still, the threat for Audi is more to its image as a technology leader, with demand for plug-in hybrids and electric vehicles expected to remain restrained. The segment is forecast to account for just 5.7 percent of global auto production in 2019, according to IHS Automotive. In Germany, Audi is selling the A3 Sportback E-tron via a network of 100 selected dealerships where service employees have been trained to work with high-voltage technology. The E-tron dealerships have an electric charging station that customers can use free of charge during business hours. 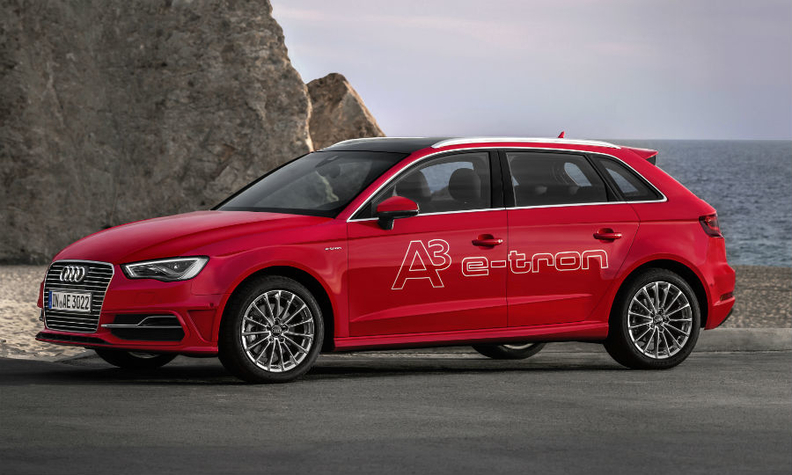 The A3 E-tron has a 150 hp 1.4-liter direct injection turbo gasoline engine and a 102 hp electric motor housed within the six-speed dual clutch transmission. As the two power sources never work together at full force, combined system power is 204 hp, Audi said. Top speed is 222kph in hybrid mode and 130kph in pure electric mode. Audi said the A3 E-tron has average CO2 emissions of 35 grams per km, equivalent to fuel use of 1.5 liters per 100 km (157 U.S. mpg). Without battery power, fuel consumption rises to 4.5 liters per 100 km, equivalent to CO2 emissions of 105 g/km. The hybrid system adds over 300kg to the car's weight, making it weigh 1,540kg from slightly over 1,200kg for an equivalently equipped A3 Sportback. Audi said it takes about 3 hours and 45 minutes to fully recharge the lithium ion 8.8 kWh battery from a 200 volt household outlet. With an industrial 380 volt charging station, recharging time decreases to 2 hours and 15 minutes, the company said.